This book has provided multiple scientific studies and research and now it is time to look at how we can apply this information to spread the word and communicate the importance of a rich language environment, parent talk and its relation to the developing brain and the achievement gap many children in America face. Below are some ideas I thought about based on what I read or examples stated in the chapter. In the chapter they discussed the Thirty Million Words and the power of parent talk be included in discussions at obstetric clinics, maternity wards, physician offices, as part of early intervention curriculum, and being a part of standards that could be incorporated into state early learning standards for child care facilities. When I first thought about this, I must admit I got a little overwhelmed of how I could be a part of such a change. Soon though I started to try and break down the big picture a bit and think of simple things I could do on any given day to start to bring awareness to the program, the message and the implications. The list below are things I am committing to doing to feel empowered and to attempt to be part of the solution to the information I have been reading. 1) Passing this book along to others/buying them their own copy-This was mentioned in a comment from someone else on a previous chapter. They mentioned giving a copy of the book to expectant parents. After reading this book, it is going to be my new “baby shower gift” for the parent(s) to be. 2) “Be like James”-I was inspired by the example of the parent that Dr. Suskind discussed in the chapter that became an advocate for the 3T’s. I was impressed that this parent tried to pass the information on to other people he knew so that all kids could have the same advantage that his child had. It made me think of how if I just passed this information on to one person, and they told another person and so on the domino effect that could happen and the impact this could have. I thought it was creative of this parent to use Skype to spread the word to people he knew. While I do not have children in a child care setting I thought it was a great idea that this parent took it upon himself to talk to his son’s day care about the program. It made me think that if I spoke to my friends about this program, then they went to their children’s day care etc., what a great improvement this could lead to. 3) Contacting Public Health-this book has mentioned how early language environments and ensuring all children have access to rich language environments for their developing brain is part of public health. I was curious if the Louisville Public Health Department had any programs remotely related to early language environments and/or child development so I searched their website to see what I could find. There were several programs for helping women have healthy babies, access to medical care throughout their pregnancy and even mentioned coaching and home visits for proper child development. The list of programs and services gave contact information for a point person for each program and I am interested in contacting several programs that focus on birth to 3 to inquire on more specifics about what they include and if there were any other initiatives related to early language environments and supporting parents for creating these. 5) Donate: The website has a place for donations that can be made to the Thirty Million Words Initiative to support the work of the program, initiative and research. Even if it is just a little bit, I can skip a Starbucks trip and make a quick donation online. The above is my starting point for applying and trying to take action based on all this information. I would love to hear what everyone else’s ideas are. In my opinion, this chapter emphasizes one of the most challenging parts of our job as school-based speech-language pathologists: In order to make the greatest change in our students, all parents, caregivers, team members, teachers, doctors, essentially all adults in the country, need to understand the problem in order to be part of the solution. In all of our discussions with teachers in the hallway of our schools, parents in ARC meetings and outside service providers through e-mail, we are always striving to teach (“sell” might be a better word) that language is so very important to the development of our students. This chapter was all about getting everyone on the same page to create lasting impact on the language skills of our children, particularly birth through age three. Suskind explains that while the achievement gap for school age children is impossible to hide from, the birth through three age group is a fairly invisible period. The achievement gap is already noticeable at this young age; however, without analyzing scientific research and data, it is easy to miss. To solve this problem, we must know when the problem begins, as well as what to do about it. The hard part is getting adults to understand the importance of the early language environment before it is too late. By far, America’s greatest resource is its children. These babies will grow up to be the future citizens who will attempt to make this world productive and established. In order to help them develop into the best versions of themselves, America needs to utilize its second greatest resource—parent talk. Suskind defines parent talk as “the quality and quantity of words in an early language environment”. As SLPs, we know just how powerful parent talk is to our children. We are the ones who clearly understand the problem of a lack of quality interaction between child and caregiver and actively support the solution. But it’s not enough for us to know and work toward the goal on our own. We need society, most importantly parents, to get on board with us to achieve optimal success. Suskind goes on to explain that through the Nudge Theory, we can expand our impact and share our knowledge with those closest to us in hopes that small nudges will create a ripple effect of “spreading the words”. Kudos to us because: THIS IS WHAT WE DO EVERYDAY. Great things can happen when the power of parent talk is shared during natural conversations with teachers, parents, doctors, other professionals. How many times during ARC meetings do we suggest that parents read with their kids, ask them questions, take the time to engage in normal conversation without technology around? The author used the example of James in the chapter. He appears to be a wonderfully involved father who demonstrated that one person really can make a huge difference. He completed the Thirty Million Words program and was so inspired by the impact it had on his son that he wanted to share his knowledge with family and friends. He taught the Three T’s through skype, through conversation and by example. He showed that parents really are the key to change in the youngest population of students. In summary, this chapter reminds us that children aren’t born smart, they are made smart through engaging with parents and caregivers, and specifically when the parents tune in, talk more, and take turns. By sharing this information with parents of young kids, we can give them the power to change their child’s brain and future. How have I used my WHAS Crusade iPad? It can be time-consuming and messy to move speech materials back and forth between schools. Having an iPad has significantly cut back on the amount of materials that I need to load into my bag/car each day. The two apps that I most often use are. 1. ) Articulation Station by Little Bee Speech – students practice speech sounds at word/phrase/sentence levels with picture cues, stories, and a matching game. You can save data under student profiles and e-mail data to yourself and/or parents. Another way that I use my iPad is to encourage the use of core vocabulary words with my self-contained students. This school year, I have been using Jenna Rayburn’s “AAC Core Word of the Week” resources from Teacher Pay Teachers. I focus on a new core vocabulary word every 2 weeks. The packet includes visuals, handouts and suggestions for toys, books, and iPad apps to use for each word. For example, the app “Build and Play 3D” was the suggested app for the word “go”. The students always love an excuse to get on the iPad and it’s a great way to model and encourage spontaneous language use. Many of the apps suggested are free, but some do cost money. Thank you to the WHAS Crusade for your generous iPad donations to the speech-language pathologists of JCPS! 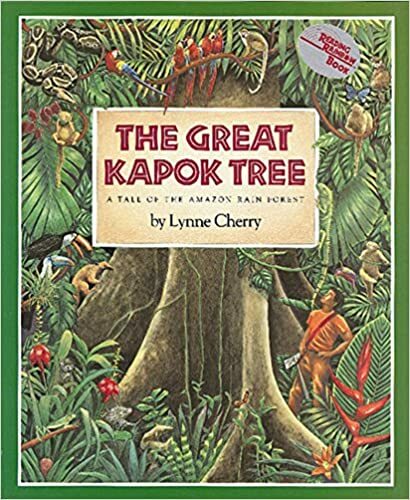 In honor of Earth day (4/22) our Literacy unit for the month of April will feature The Great Kapok Tree. Below are the ideas the group produced! – Where are rainforest located? Fluency- copy pages and color code sentences to use different different strategies with (ex. Articulation- highlight target sounds for single words, highlight sentences, oral reading, etc. In the original draft of this post, the application paragraph appeared last. I have moved it to the top. My thoughts on application are all in the first paragraph. The remaining paragraphs are a long-winded rant, followed by a link to a relevant This American Life Episode about the Harlem Bay College. I have three thoughts on Chapter 6 application. 1) If we are going to ask parents to change how they talk to their children, perhaps it should feel like a conversation rather than an assignment, even if that conversation is delivered with a handout. 2) The IEP process does not help, in my experience, to create a feeling of team between the school and the parents. I think that often the school and parents are a very solid team, but I don’t think IEPs help. How do you create a feeling of conversation and team with your teachers and parents? 3) This chapter emphasizes the need for data to guide intervention. I sometimes make the mistake of looking at the data to see only what the child is doing right or wrong, and not what I am doing right or wrong. This may be my professional growth goal for next year. So…. Chapter Six. Was anyone else creeped out by this? I have been reading along rapt and on-board. I think our education as SLPs sets us up to believe in the power of early language environment and even if aren’t early intervention practitioners, we get it: Joint attention, expansion, extension, turn taking, talk talk talk. I was interested in the research showing how early language affects not only language but also processing and learning. I was intrigued by the inter-relationships between the effects of early trauma and stress and early language environment. I was excited by the tie-in to growth mindset. And then…. The idea of trying to mess around in the private life of a disadvantaged family is one that makes a lot of people uncomfortable. It’s essentially telling poor parents that there’s a better way to raise your kids, and we’re going to tell you how. But somehow, that’s not what it feels like at Baby College. It feels like a conversation, like we’re on your side. Like it’ll be fun. In program development, there is a paradox because parents are often an afterthought. To really set children up for success in the established education programs (K-12), it is “school readiness” which is imperative. The lack of “school readiness”, which occurs prior to entry into K-12 education, is what causes some students to be constantly ‘catching up’. Dr. Suskind writes that an ideal program for birth-to-three would be set in the home to help parents by setting language goals, providing careful monitoring to help parents achieve the language goals, and have built in procedures for evaluation and improvement. With program success dependent on a strong support system. ~Is First Steps similar to this? Annettee Lareau, author of Unequal Childhoods, published her research in which 12 families from across socioeconomic backgrounds, each with a 9-to-10 year old child, were intimately studied. What was similar? “All families want[ed] their children to be happy and to grow and thrive.” What was different? Professor Lareau used the term “concerted cultivation” – very similar to Dweck’s Growth Mindset- to describe the interactions parents from Middle Class families engaged in with their child[ren]. They were constantly driving them to and fro various activities, leading highly structured and planned lifestyles, with much talking which included debate and discussion. Families with lower SES, were described using the term “natural growth”- very similar to Fixed Mindset- observed as less structured, and with a heightened focus on obedience and respect for authority. Communication was not characterized by discussion and debate in these families from lower SES, however they used simple directives. Suskind gives the example of a parent telling a child to go wash their face by simply holding out a washcloth and speaking one word: “bathroom”. ~Did Dr. Suskind’s explanation of this study create a blaring image for you? I can visualize the differing lifestyles and the daily vocabulary menu for each. TMW went into a Maternity Ward and asked new mothers if they agree or disagree with this statement: “How smart your infant will become depends mostly on his or her natural intelligence at birth.” Although the responses were not divided rigidly along SES class lines, the lower SES mothers were more like to agree with the statement than their higher SES counterparts. When people are told over and over that they “can’t”, “Not you, you’re just not smart enough, you’ll never do it,” reinforced by numerous societal restraints, what is the outcome? saw their newborns as cute, loveable, and having malleable potential. This gives us hope! ~Can we as SLPs influence parents to have a growth mindset? The Moorman-Pomerantz Study looked at what impact parents mindsets (growth vs. fixed) have on a child’s test performance. Parents were divided into two groups. The fixed mindset parents were told the test measures their child’s “innate” ability. Therefore, as expected, these parents were not constructive in helping their children. They were criticizing, controlling, and much more likely to take the pencil from their child and complete the problem themselves. On the other hand, parents given the growth mindset were not a full 180 in their interactions. The growth mindset parents were just less controlling and unconstructive. Just because a parent has awareness that a child’s intelligence is malleable, does not mean they have the techniques to use this knowledge. ~How can we as SLPs spread the word about the Three T’s more widely? Social media? Threcia, a mother of 6, had a 7th grade education, and spent her entire life working as a maid. She was determined to push her children towards achievement and had very high expectations for them. Therefore, her children had high expectations for themselves. One of her daughters, Portia, is now the Executive Director of Educare who’s 1st Early Childcare Center is now considered a National Standard for High Quality Learning. Portia, started an Educare Alumni program for parents to share their success stories. Portia attended and was impressed by their stories. She was excited to share their stories with her coworkers. However, some of her co-workers weren’t impressed. Portia felt burdened by the question/ existence of a “societal fixed mindset”. ~Do we believe that somethings can never change? I like this quote from author Wes Moore, “We are products of our expectations. Someone, at some point, put those expectations in our minds and we either live up to them, or live down to them.” ~Personally I expect a lot from myself, and that was instilled in me by my loving parents. Do my students have expectations for themselves? Do their parents set expectations and/ or dreams for them? Even if not, through my therapy sessions can I set expectations that will extend outside my classroom? And into my the children’s future? Can we, as SLPs, be a catalyst for increasing expectations? The parents in TMW are an inspiration. They were excited to build their child’s brain. And against adversity at all odds. These parents put in so much energy, coming from difficult lives filled with violence and unstable housing (couchsurfing, apartments in high crime areas, etc). They worked hard to change from a fixed mindset. The parents from TMW were reawakened to pursue their own dreams and reach their full potential. Statistics tell us we have a problem and the science shows us how to solve it. But how do we make the change? It must be a conscious universal effort. The necessities for children: food is second nature, but a rich language environment is fairly recent. Everyone, parent or not, needs to know the importance of early language environment. Ultimate Goal: All children have the chance to fulfill their potentials. I had a discussion with 3 of my 1st grade students on what is a noun, and what is a verb. We generated answers together and wrote them on a green paper together. Then each student had a bubble map, and yellow pictures of verbs to make their own practice paper. When we were finished, I asked one of my students if he wanted me to make a movie of him as he explained the verbs he had spontaneously written on my old blackboard. He was so excited to do this! All the kids enjoyed watching him give his short presentation on verbs! I thought that playing these short movies for my students will be a great way to incorporate self-evaluation, plus they love watching themselves!